Rinse and dry tomatoes. Put in large bowl. Mince garlic and chop chives and add to bowl. Add one tablespoon herb mix and Extra Virgin Olive Oil and stir. Sample a tomato and add more seasoning to taste. Pour the entire contents of bowl into a large sheet pan with sides. Roast for about 20 minutes until the tomatoes pop. This can also be done on the stove in a large skillet. Meanwhile, boil a large pot of water and cook orzo according to package directions. Drain. 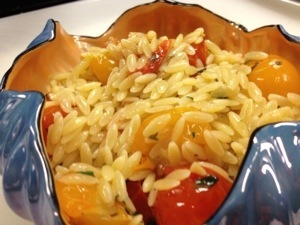 Add drained orzo to the tomato mixture. Mix well and pour into a serving bowl. This is a great recipe to use left over uncooked macaroni. I put leftovers into a plastic container until I have enough for this recipe or for macaroni and cheese. Before cooking, put it all in a paper bag and pound gently with a rolling pin, meat mallet or frying pan. The pieces cook more evenly. Enjoy! Bring me your battered, your broken, your bruised…tomatoes and I will show you how to have a star on your table! This no-cook sauce will become a regular in your kitchen repertoire every summer and fall. As soon as the tomatoes ripen this sauce should always be on your counter. The leftovers make a great pizza! Click here for the recipe. Below you can see a step by step way to turn “almost bad” tomatoes into a “so good” dinner. Core them and gently squeeze the tomatoes into a bowl. Strain the discarded tomato pieces into a large bowl. Chop tomatoes and add to bowl. Smash a few (2-3) garlic cloves to remove the skin. We are big fans of garlic so I smash a bunch (5-6). Chop it but don’t concern yourself with even pieces…part of the beauty of this dish is the lack of perfection! Chop some fresh basil leaves. I clipped some from my plants outside on my deck. Stir in the garlic, basil and olive oil and season with salt and pepper, to taste. Remember, you can always add but can never take away…use only a little at a time and taste as you go. Don’t worry if the garlic tastes a little sharp…it will meld with the other favors as it sits on your counter. Please do not refrigerate this sauce…it completely changes the character. If you do not use it for a few days and must refrigerate, let it sit on the counter until it gets back to room temperature. Do this in the morning and let it sit all day stirring occasionally, gently mixing all the ingredients. If you are not home all day…no worries. It’s just fine on it’s own. When it’s time for dinner, fill a large pot with water and cook the Penne according to package directions. Drain and add to a pasta bowl. 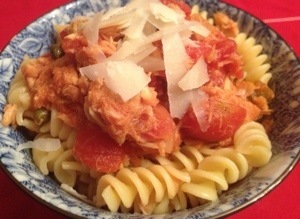 With a ladle, gently press down on tomatoes and add 2-4 (depending on how juicy the tomatoes are) scoops to the macaroni. Add most of the cheese and toss gently. 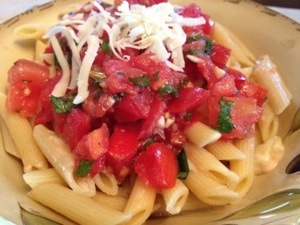 Assemble into individual bowls, first a serving of Penne, a scoop or two of the tomatoes and a little more Fontinella cheese.